I'm beyond thrilled to have YABC host the cover reveal of my novel, THE WEIGHT OF ZERO. It was a difficult task but I think the cover perfectly captures the turmoil of a girl who has to deal not only with the standard pressures and stress of high school but also a much heavier weight – a mental illness. Mega kudos to my editor Kate Sullivan and team at Delacorte! I hope you like it! Seventeen-year-old Cath knows Zero is coming for her. Zero, the devastating depression born of Catherine’s bipolar disease, has almost triumphed once, propelling Cath to her first suicide attempt. With Zero only temporarily restrained by the latest med du jour, time is running out. In an old ballet shoebox, Cath stockpiles meds, preparing to take her own life when Zero arrives. But Zero’s return is delayed. New relationships along with the care of a new psychiatrist start to alter Catherine's perception of her diagnosis. But will this be enough? This is a story of loss and grief and hope and how the many shapes of love – maternal, romantic and platonic – impact a young woman’s struggle with mental illness. My path to publication was a long and indirect one. I graduated from the University of Scranton with an accounting degree and followed that up with a law degree from Georgetown. While I toyed with the idea of writing, the bug didn't officially bite until about six years ago. My second full manuscript became THE WEIGHT OF ZERO. It was awarded the 2014 SCBWI Work-in-Progress Grant in the Contemporary YA category and also named a finalist in the 2015 Tassey-Walden Awards Contest. 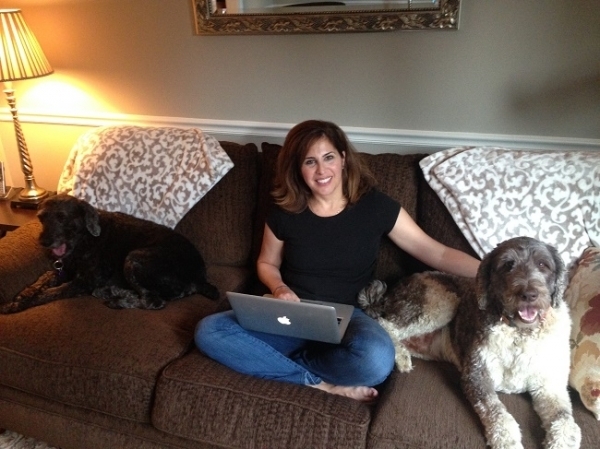 Right now, I'm working on my next YA novel with a little help from my dogs! 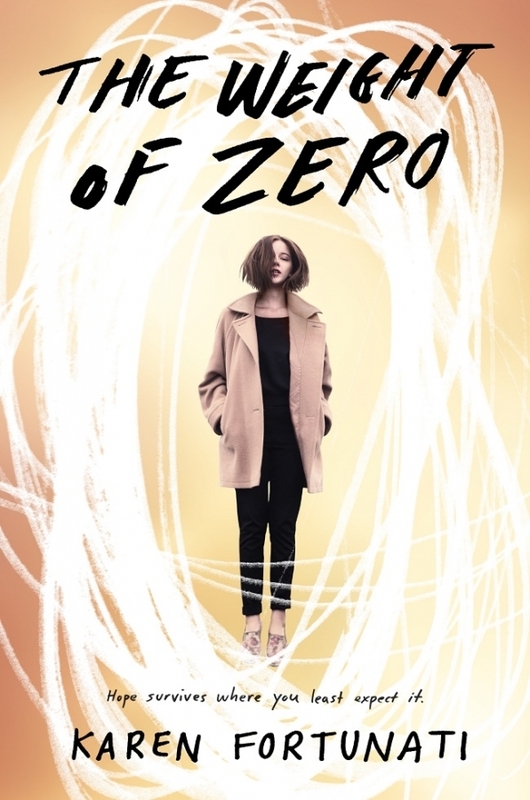 Three winners will receive a signed copy of THE WEIGHT OF ZERO and a one hour telephone chat with the author. I'm actually so excited to read this book! The cover is awesome, but the synopsis has me really intrigued. It sounds like a really unique portrayal of mental health issues. I've always been really interested in different takes on mental health struggles since they're so personal and often hard to grasp. Really intrigued to read this and maybe get a chance to pick the authors brain for an interview! Love the look of this cover, and excited to read it. One of my most-anticipated reads of 2016. I'm always looking for more accurate and honest representation of mental illness in YA. This looks amazing and unique. I feel like I would really enjoy it. The cover would look amazing on my shelf as well!! The cover is very interesting and unique and I love the way the circles are all around her. I think books about mental health issues are always interesting, but this one especially intrigued me and got my attention and I'm really looking forward to it! Oh, and by the way, I LOVE talking to authors. It gives so much more context to the book! The cover is very interesting and unique and I love the way the circles are all around her. I think books about mental health issues are always interesting, but this one especially intrigued me and got my attention and I'm really looking forward to it! Oh, and by the way, I LOVE talking to authors. It gives so much more context to the book! It sounds like a very interesting book. i can't wait to pick it up. Thanks so much for the wonderful comments! I can't wait for the book to be released. And I'm really looking forward to chatting with the winners of the raffle and hearing their thoughts. It will be like having a mini-bookclub! I'm really looking forward to reading this book and THE COVER IS GORGEOUS!!!! The cover makes this book look very interesting. It stood out from the others and the synopsis makes me want to read the book even more!